The next step for us was to seek counsel from godly people in our lives. We asked many people who know us to affirm this call on our family, to speak about any concerns they had/have, and to share godly wisdom and advice they may have about adoption with us. And we continued to pray. This season ended up taking six months which we know is simply a glimpse of the rest of the process. The theme of international adoption seems to be: Hurry up and wait! We reached the six month point of waiting and praying on August 4, 2011, and felt like the Lord was giving us freedom to move ahead into researching specific country programs and adoption agencies, and gathering paperwork for our homestudy. We don’t know much more than that right now. It feels like every time one question gets answered about adoption for our family, two more pop up in its place! So, of course our story is “to be continued”… but for now, you’re mostly caught up. We’ve barely dipped our toes into the middle of the story… so we wait as anxiously as you to see the next part unfold in God’s timing. I was ready to adopt, Hubby was ready to adopt. It was time to let our families know. Living overseas puts us in a weird predicament when breaking news to people we love. Do we call? Skype? Email? Snail Mail? Facebook? Tweet it? Blog it? We decided to compose a letter letting our families know of our plans…and emailed it out. We wanted to share some news with you, and to save you from dropping dead from a heart attack on Skype, we thought we’d send you some warning first! We are starting the process to adopt a little girl. Adoption has been on Sheila’s heart for a long time, and yesterday Andrew took a day away to seek the Lord specifically in the area of adoption for our family and we are now ready to proceed (though we are prepared for the process to take 1-2 years). So we can better understand our own adoption into God’s family. To show that our family is undeniably pro-life by rescuing a life that was born and not aborted. So that we can give God the glory when He provides the resources needed for the adoption of a little girl. To bring a life into our home to share everything with, especially the Gospel of Jesus. To raise another child to be a lover of God and a disciple of Christ. To save a little girl who would otherwise live a life of poverty. To give her a home, a hope, a future, a family. To set an example (for God’s glory) to other believers that caring for the orphan and the widow is true, undefiled religion and is necessary for followers of Christ. To open up spiritual conversations with unbelievers about why we choose/chose to adopt. You have loving supported us in everything we have ever done, even when it was hard and costly for you, and for that we are so grateful. 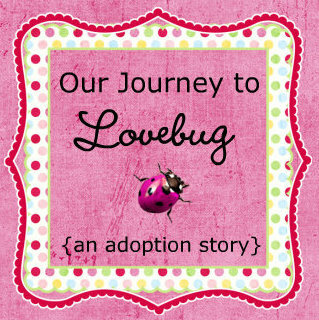 We hope you will be our biggest cheerleaders through the adoption process, and that you will pray for and love our daughter just as you have Ladybug, Stinkbug and Doodlebug. We love you! Call us today! Big news always seems a little more official after you tell someone. And our families are great big news-getters! They have exclaimed and laughed with joy after each pregnancy announcement, and the adoption announcement was no different! So, now someone else knew. It was time to take the next step. I’ve always wanted to adopt a child (or children). I distinctly remember telling my parents that I did not want to have biological children, so I hoped they would love the rainbow of children I would add to our family. (For the record, I was probably less than 15 years old when I declared that.) Hubby says he always kinda figured we would adopt in the future, but that always seemed like a ways away. At the beginning of 2011, the serious talk about adoption began. Doodlebug was here, and he was/is our last (planned) biological baby, so adoption naturally surfaced in conversation. Was this really something we wanted to do? More importantly, was this really something God was calling our family to do? There are plenty of things to think and pray through before one makes any kind of serious decision… and the thinking and praying had started for us. Lady, Stink and Doodle are pretty close in age, so we knew if we were going to adopt a little girl to complete our family, we didn’t want a huge age gap between her and our other children. This is a permanent decision. If we pursue adoption and bring a baby/child home, it’s the same as getting pregnant and bringing a baby home- it’s forever. Are we spiritually/emotionally/physically ready to enter into a possibly emotional/tumultuous/uncertain/ever-changing adoption process? What are the implications for adopting internationally while living abroad? How do we find an agency to work with? So, Hubby and I spent time talking, thinking, praying, searching, wondering, dreaming, explaining, praying again… and on February 4, 2011, he told me he felt like God was indeed calling our family to adopt a little girl. Our Lovebug.